Henry Darger was born in Chicago in 1892. After the death of his mother he was placed in a Catholic home for boys and then into the Lincoln Asylum for Feeble-Minded Children in rural Illinois, from which he ran away at the age of seventeen. Darger lived a solitary life, working as a janitor in a Chicago hospital from around the age of thirty until his retirement in 1963. A devout Catholic, Darger went to mass every day. During this time Darger created the work for which he is now known. Alone in his room, unknown to those around him, he gave tangible, visible form to an epic story of legions of pre-pubescent girls—with paper-doll faces and unexpected male organs—who battle for their lives against monstrous foes who seek to torture, kill or exploit them. This, his magnum opus, is commonly referred to as In the Realms of the Unreal, though Darger’s actual title is The Story of the Vivian Girls, in what is known as the Realms of the Unreal, of the Glandeco-Angelininian War Storm, Caused by the Child Slave Rebellion, and spans over 15,000 single-spaced typewritten pages. This expansive, complex narrative together with over 300 imaginatively constructed fantasy drawings have come to be regarded as one of the 20th century’s most original and unusual literary works. It was not until after Darger’s death that the full scope of his artistic production became known. His landlord, Nathan Lerner, himself an artist and inventor, discovered Darger’s artworks after the artist was sent to a nursing home just before the end of his life. After the reclusive artist’s death, Lerner devoted much of his time and attention to the gathering and dissemination of Darger’s art and related, archival materials. Nathan Lerner died in 1997 at which point his wife Kiyoko Lerner took over managing the artist’s estate. Elledge, Jim. Henry Darger, Throwaway Boy: The Tragic Life of an Outsider Artist, New York: Overlook Press. Piglia-Veronese, Paolo. Upward Crashes, Fracture’s Topoi: Musil, Kiefer, Darger. New York: Atropos Press. Biesenbach, Klaus. Henry Darger. New York: Prestel. Koide, Yukiko and Tsuzuki, Kyoichi. Henry Darger’s Room: 851 Webster. Tokyo: Imperial Press. Bruit et fureur: l’œuvre de Henry Darger/Sound and Fury: The Art of Henry Darger, essay by Edward Madrid Gómez, New York: Edlin Gallery, 2006, 2008, 2009. MacGregor, John M. Henry Darger: In the Realms of the Unreal, New York: Delano Greenridge Editions. Biesenbach, Klaus and Kiyoko Lerner. Henry Darger: Disasters of War. Berlin: KW Institute for Contemporary Art. Anderson, Brooke Davis. Darger, The Henry Darger Collection at the American Folk Art Museum, essay by Michel Thevoz, New York: Harry N. Abrams/American Folk Art Museum. Bonesteel, Michael. Henry Darger: Selected Art and Writings. New York: Rizzoli. MacGregor, John. Henry J. Darger: Nei Regni Dell’ irreale. Fondazione Galleria Gottardo/Collection de l’Art Brut, Capelli. Nathan Lerner and Stephen Prokopoff. Henry Darger: The Unreality of Being. University of Iowa Museum of Art. Joseph Nechvatal, "The Radical Ambiguity of Henry Darger," Hyperallergic, October 2. 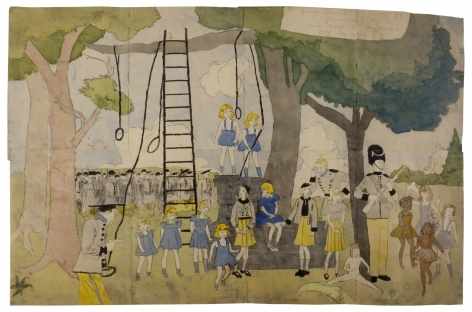 Forrest, Nicholas, “Henry Darger’s Epic 60-year Secret Art Project at MAM Paris,” Blouin Art Info, Web, May 27. Ebony, David. “Outing Darger,” Art in America, vol. 102 no. 4, April. Lirette, Christopher. “Odd Future, Henry Darger and Art Brut,” Art Papers Magazine, vol. 38 no. 1, January/February. Greenwald, Jordan, “Objects, Lost and Found: Henry Darger and the Art of Salvage,” Qui Parle: Critical Humanities and Social Sciences, vol. 21 no. 1. 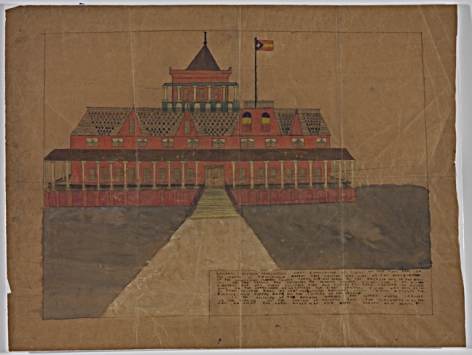 Steinhauer, Jillian. “On Henry Darger’s 15,000-Page Novel.” Hyperallergic, February 18. Martinez, Alanna. “Shows That Matter: Exploring Henry Darger’s Mysterious Universe at Ricco/Maresca.” ArtInfo, January 7. Trent, Mary. “’Many Stirring Scenes’: Henry Darger’s Reworking of American Visual Culture,” American Art, vol. 26 no. 1, Spring. Bonesteel, Michael. “Heroes and Villains: Michael Bonesteel Reveals Henry Darger’s dramatis personae,” Raw Vision, no. 74, Winter. Johnson, Ken. “Where Beauty Collides With Creepy.” New York Times, May 13. Harris, Bryony. “Into the Realms of the Unreal.” Under the Influence, Spring. Smith, Roberta. “Where Outsiders Come in From the Cold.” New York Times, January 8. D’Alessio, F.N. “Posthumous fame grows for artist Henry Darger.” San Francisco Chronicle, July 29. Johnson, Ken. “An Insider Perspective on an Outsider Artist.” New York Times, April 18. Johnson, Ken. “Visionaries in a Bubble, Safe from Convention.” New York Times, January 25. Liddell, C.B. “Naïve or normal? Take a peek inside Henry Darger’s mind.” Japan Times, April 26. Breidenbach, Tom. “Henry Darger/Andrew Edlin Gallery.” Art Forum, March. Smith, Roberta. “Henry Darger: The Vivian Girls Emerge.” New York Times, January 5. Baker, R.C. “Henry Darger: The Vivian Girls Emerge.” Village Voice, November 21. “Tilly + the Wall on Henry Darger.” Modern Painters, July-August. Vernay, Éric. “Henry Darger, entre innocence et cruauté.” l’Humanité, August 8. Dagen, Philippe. “Darger et ses petites filles en guerre.” Le Monde, June 8. Perry, Grayson. “Who do you think you are calling an Outsider?” Evening Standard, August 16. O’Hagan, Sean. “Inside the Mind of an Outside.” The Observer, June 24. Jones, Finn-Olaf. “Landlord’s Fantasy.” Forbes, April 25. Kehr, Dave. “The Fantasy World of a Mysterious Artist.” New York Times, December 22. Smith, Roberta. “Hailing a Past and Future.” New York Times, December 14. Cotter, Holland. “Visions of Childhood, Showing Purity and Evil.” New York Times, April 19. Glueck, Grace. “The Horror: Apocalypses of Battles Past (and Maybe Future).” New York Times, January 12. Boxer, Sarah. “He Was Crazy Like a…Genius?” New York Times, September 16. Stokes, Mark. Revolutions of the Night: The Enigma of Henry Darger. Yu, Jessica. In the Realms of the Unreal, U.S.: Cherry Sky Films. National Museum of American Art, Smithsonian, Washington D.C.
who have recognized the withdrawn art-maker and story-teller as one of the most original talents—and as a true visionary—of his time. Darger’s art has been the subject of the monographs Henry Darger: Selected Art and Writings, by Michael Bonesteel (Rizzoli, 2000), and Henry Darger: In the Realms of the Unreal, by John M. MacGregor (Delano Greenridge Editions, 2002). The artist’s work and life were also the focus of a meditative documentary by the Academy Award-winning film-maker Jessica Yu (In the Realms of the Unreal, 2004). Other movies about Darger may be forthcoming; the California-based production company Bedford Falls, which co-produced “The Last Samurai” with Warner Bros., has purchased the rights to develop a feature film based on the artist’s life. Darger’s works are included in the permanent collections of the Museum of Modern Art and the American Folk Art Museum in New York, the Collection de l’Art Brut (Lausanne), the New Orleans Museum of Art, the Art Institute of Chicago, the Museum of Contemporary Art (Chicago), and the Milwaukee Art Museum. Darger’s art also has been featured in many notable museum exhibitions, including “The Unreality of Being,” curated by Stephen Prokopoff (University of Iowa Museum of Art, 1996; Museum of American Folk Art, New York, 1997). It was also seen in “Disasters of War” (P.S. 1, New York, 2000), where it was presented alongside works by the Spanish master Francisco de Goya and the British, contemporary-art duo Jake and Dinos Chapman. Earlier this year, an entire gallery was devoted to Darger’s drawings in “Dubuffet and Art Brut” at the Museum Kunst Palast, in Düsseldorf; that exhibition will open at the Musée d’Art Moderne de Lille-Métropole on October 10 (and run through February 1, 2006). Darger’s work has also been shown at the Los Angeles County Museum of Art, the Philadelphia Museum of Art, the Setagaya Art Museum (Tokyo), the Irish Museum of Modern Art (Dublin), and the Collection de l’Art Brut. Darger’s art is scheduled to be featured in forthcoming exhibitions at La Maison Rouge (Paris), next year, and at the Yerba Buena Center for the Arts (San Francisco) in 2007.